Elmore Smith (born May 9, 1949) is an American retired professional basketball player born in Macon, Georgia. A 7'0" center from Kentucky State University, he played in the National Basketball Association from 1971 to 1979. He was a member of the Buffalo Braves, Los Angeles Lakers, Milwaukee Bucks, and Cleveland Cavaliers. Elmore Smith was born in Macon, GA, and was a graduate of Ballard-Hudson High School in Macon. As a 5-11 high school freshman, he didn't make the team. But after sprouting to 7 feet over the next two years, Smith said, "The principal threatened me: 'If you don't go out for basketball, we're going to kick you off campus.' "
Smith attended Kentucky State University. He is listed among the top rebounders in college basketball. He was a member of the 1970 and 1971 NAIA Championship teams, coached by Lucias Mitchell, playing alongside teammate Travis Grant. He holds the NAIA record for most rebounds in a season (799 rebounds in 1971), and tops the NCAA All-Division list. In 1968-1969, Smith averaged 14.8 points and 19.8 rebounds. In 1969-1970 he averaged 21.6 points and 22.7 rebounds and in 1970-1971, he averaged 25.5 points and 24.2 rebounds, leading Kentucky State to NAIA Championships his last two seasons. After compiling career averages of 21.3 points and 22.6 rebounds, Smith left for the NBA his senior year in 1971. Smith was drafted by the Buffalo Braves in the 1st round (3rd pick) of the 1971 NBA Draft on March 29, 1971. In his first season, Smith averaged 17.3 points per game and 15.2 rebounds per game, playing alongside Bob Kauffman, and was named to the NBA All-Rookie Team. His rebounding average for that season is the eighth-highest ever recorded by an NBA rookie. In 1972-1973, he averaged 18.3 points and 12.4 rebounds for the Braves. Then, on September 12, 1973 he was traded by the Braves to the Los Angeles Lakers for Jim McMillian. With the Lakers in 1973-1974, Smith averaged 12.5 points with 11.2 rebounds and a league leading 4.9 blocks for Coach Bill Sharman. 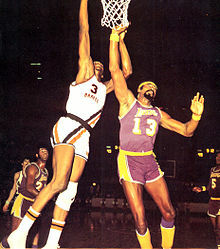 In 1974-1975 Smith averaged 10.9 points and 10.9 rebounds with 2.9 blocks for the Lakers. On June 16, 1975 Smith was part of a historic trade. He was traded by the Los Angeles Lakers with Junior Bridgeman, Dave Meyers and Brian Winters to the Milwaukee Bucks for Kareem Abdul-Jabbar and Walt Wesley. After 34 games with Milwaukee in 1975-1976, Smith was traded on January 13, 1977 with Gary Brokaw to the Cleveland Cavaliers for Rowland Garrett, a 1977 1st round draft pick (Ernie Grunfeld was later selected) and a 1978 1st round draft pick (George Johnson was later selected). In 1976-1977, Smith averaged 12.5 points, 8.4 rebounds and 2.2 blocks for the 43-39 Cavaliers under Coach Bill Fitch. Smith was plagued by a knee injury, that required surgery, and played in only 24 games for Cleveland in 1977-1978, the last of his career. Smith is best remembered for his shot-blocking, earning him the nickname "Elmore the Rejector". He led the league in total blocked shots twice (in 1974 and 1975), and holds the NBA record for most blocked shots in a game since 1973, with 17  He achieved this mark against the Portland Trail Blazers on October 28, 1973, while playing for the Lakers. Smith's average of 4.85 blocks per game from the 1973–74 season (the first season blocked shots were officially recorded in the NBA) is the third highest ever. He was also a skilled rebounder, and he averaged a double-double (13.4 points, 10.6 rebounds) over the course of his career. Smith is the father of three daughters. Smith has remained in the Cleveland area and is frequently seen at Cavalier games. Smith was inducted into the Kentucky State Athletics Hall of Fame in 2002. In 2008, Smith was inducted into the Georgia Hall of Fame. Smith was inducted into the Greater Cleveland Sports Hall of Fame in 2014. In 2017, he was inducted into the Small College Basketball Hall of Fame. During Smith's first two seasons, blocks and steals were not an officially recorded statistic. ^ a b c d e Crowe, Jerry (14 November 2010). "There's one memory of his NBA career that Elmore Smith won't ever block out" – via LA Times. ^ a b "Elmore Smith". collegehoopedia.com. ^ a b c d "Elmore Smith Stats". Basketball-Reference.com. ^ "1973-74 Los Angeles Lakers Roster and Stats". Basketball-Reference.com. ^ "Elmore Smith Stats". Basketball-Reference.com. ^ "1977-78 Cleveland Cavaliers Roster and Stats". Basketball-Reference.com. ^ "1978-79 Cleveland Cavaliers Roster and Stats". Basketball-Reference.com. ^ a b c "Smith, Elmore - Cleveland Sports Hall of Fame". ^ "Regular Season Records: Blocked Shots". nba.com. Retrieved 2011-03-16. ^ "Elmore Smith's Gourmet BBQ Sauce". elmoresmithbbqsauce.com. ^ "Kentucky State University Athletics - Elmore Smith - Class of - Hall of Fame - Kentucky State University". ksuthorobreds.com. ^ "Smith, Elmore "The Big E" · Notable Kentucky African Americans Database". nkaa.uky.edu. ^ WKYT. "KSU great Elmore Smith inducted into Small College Hall of Fame". www.wkyt.com.